Neil and Derek are building a Lincoln to a design being done by Steve Holland. This page details their progress. Text and pictures provided by Neil and Derek. Having read the “Lincoln at War 1944-1966” by Mike Garbett and Brian Goldin, it raised the question if we could build a large scale model and do justice to the full size plane. The Lincoln was a development from the Lancaster for use with the allied Tiger Force in the pacific. 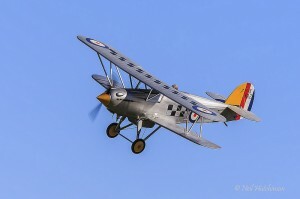 It was also the last piston engined bomber to be used by the Royal Air Force. 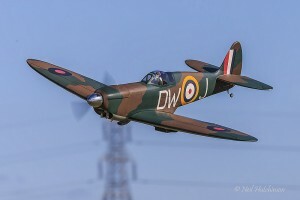 This is one of the features that made it an attractive project for us to model since it represented the pinnacle of the British piston engined heavy bomber. The surrender of Japan deprived it of the chance to prove itself in World War II, but became the workhorse of the bomber squadrons in the post war years bridging the gap between the infamous Lancasters and the V bombers. 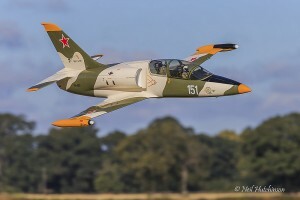 It saw service in Malay, Aden and Kenya, it also played an important part as a test bed for the new jet engines, aircraft equipment and aviation techniques. It was widely used for crew training, navigation and bombing trials with the Central Bombing Establishment bomb ballistics unit. 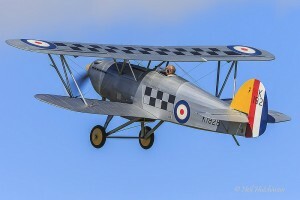 It was extensively modified by the Royal Australian Air Force and showed its versatility in maritime resonance duties as the mark 31, where approximately 6ft was added onto the nose. After much discussion we decided to give it a go and we would make a model Lincoln, Neil made extensive searches on the web to obtain as much information as possible to enable the construction to start. Books and web pages found included “The Avro Lancaster, Manchester and Lincoln” from SAM Publications and the Warpaint No.34 Avro Lincoln which contained a particularly good three view. We also visited the Aerospace Museum at Cosford where a full size Lincoln is exhibited; this allowed us to take a number of pictures, the visit also served to reinforce our opinion that this is a fantastic aeroplane. With this information we then explored possible sizes of model that seemed sensible, ranging from 1/8th to 1/6th (anything larger would require and extension to the building shed!). 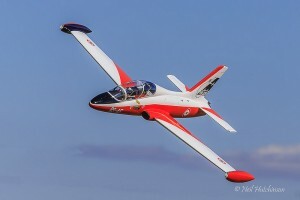 Discussing our intended project with Steve Holland brought an unexpected offer to use the three-view that we obtained and Steve’s wealth of knowledge and experience to design a 1/6th scale model. Following an initial visit to Steve’s where the design concept was laid out, Neil and I listed the required materials and made arrangements to collect at Haigh Hall in 2005; enough 3mm lite ply and cyparis to build a reasonable size garden shed, along with the largest wing joiners we had ever seen, from Solutions and Falcon Aviation. After Haigh Hall copious amounts of balsa were required with Derek justifying this trip to his wife as a visit to his daughter and grandson. We registered the model with Tony Hooper on the Over 20kg Scheme, who assigned Pete Siggins as the inspector for the model, with whom we had a number of discussions outlining the project, design and construction methods to be employed. As the construction has progressed we have had regular checks by Pete, as part of the requirements for the Certificate of Design and Construction. 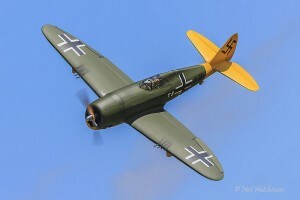 Modelled On: RF – 398 (exhibit at Cosford Aerospace Museum). 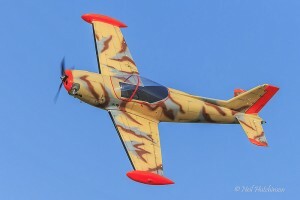 Power: Four 62cc Zenoah petrol engines. 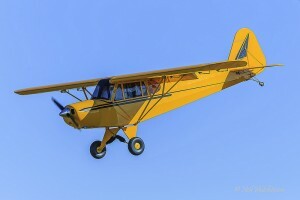 Intended Functions: Elevators, Ailerons, Rudders, Throttle, Flap, Retracting Undercarrage, Bomb Bay, Bomb Drop, Landing Light. 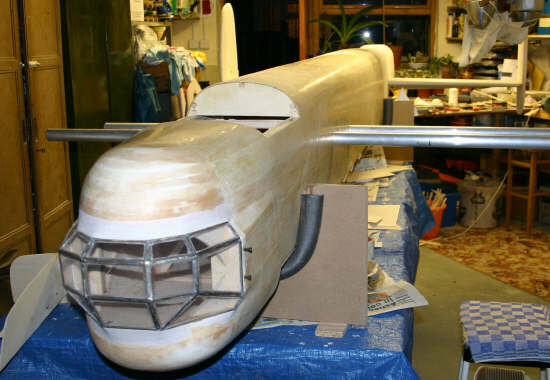 The construction materials for the model are lite-ply, birch-ply, cyparis, balsa, pine, loads of super thin cyano and quick acting white glue, super light filler and P38 for special areas, along with glass cloth and epoxy. 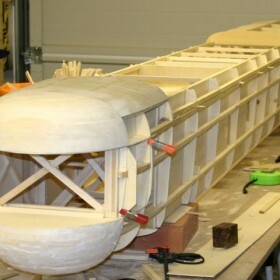 The model construction commenced with the fuselage. 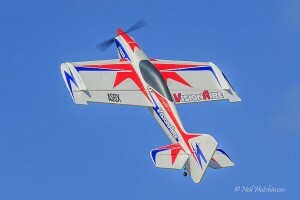 This uses internal lite-ply sheet sides with 12mm x 6mm balsa and cyparis bracing. 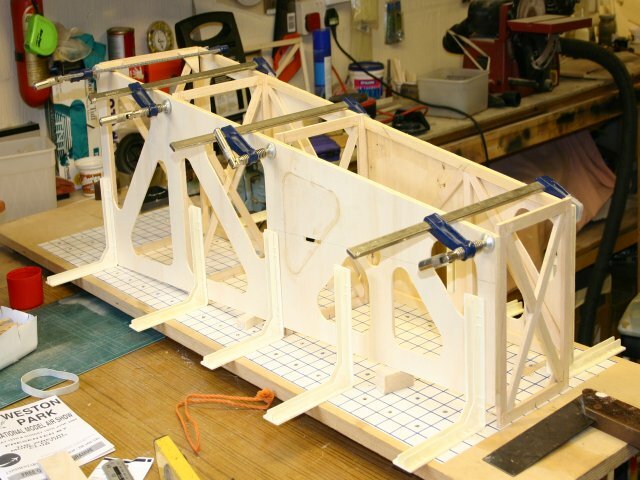 The sides are kept apart by 12mm x 6mm balsa cross formers with ply corner and centre braces and the same method is employed running along the length of the fuselage between the formers to keep everything straight. 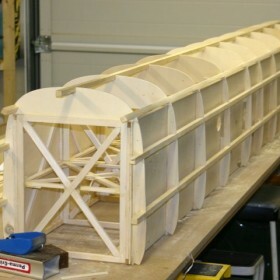 The main structure of the fuselage is clad with 3mm lite-ply formers and pine stringers, covered with 3mm balsa to give the shape of the Lincoln. 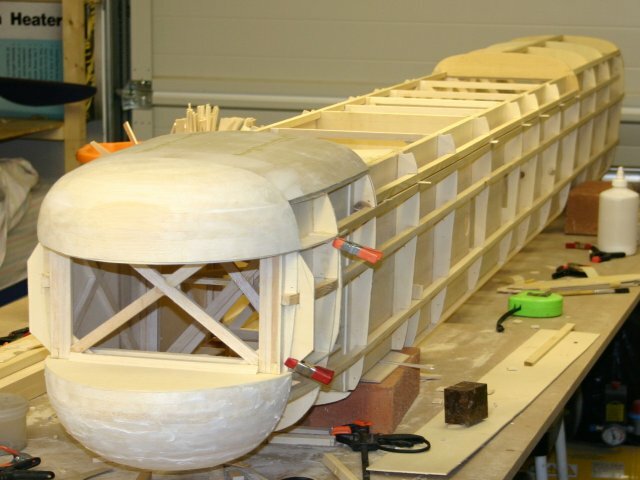 The pheonelic tubes for the wings pass through the lite-ply sides with reinforcement on the outside face under the skin, the tubes being bonded to formers thought the fuselage. 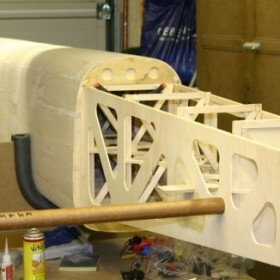 The rear of the fuselage is removable leaving about 9ft forward of the break and 4ft behind the break containing the tail wheel and turret and also providing mounting for the removable tail. The following pictures illustrate the process. 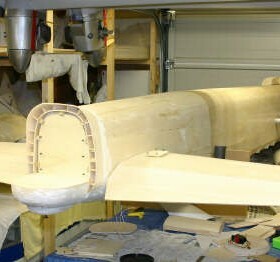 The start of the fuselage. 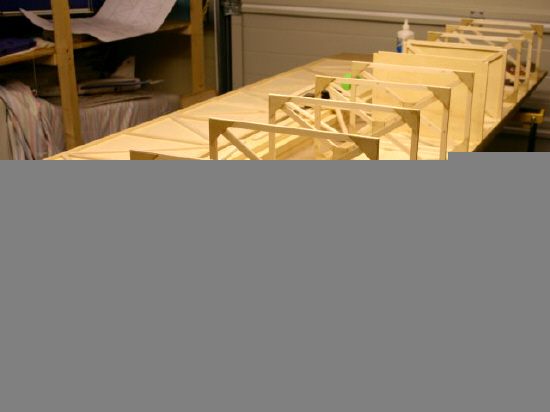 The construction begins with the production of a box…. …..formers are then added to give shape……. …. and filled-in with balsa bocks. 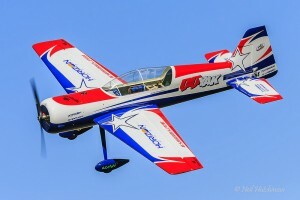 The tail uses cyparis spars with 3mm lite-ply formers, with the phenolic tube running most of the way through the stabiliser. 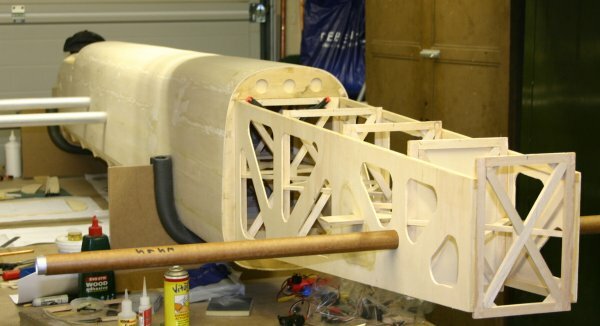 The tail halves are retained by a cap head bolt passing through a 6mm birch ply tongue attached to the fuselage, into a t-nut in the body of the stabiliser. 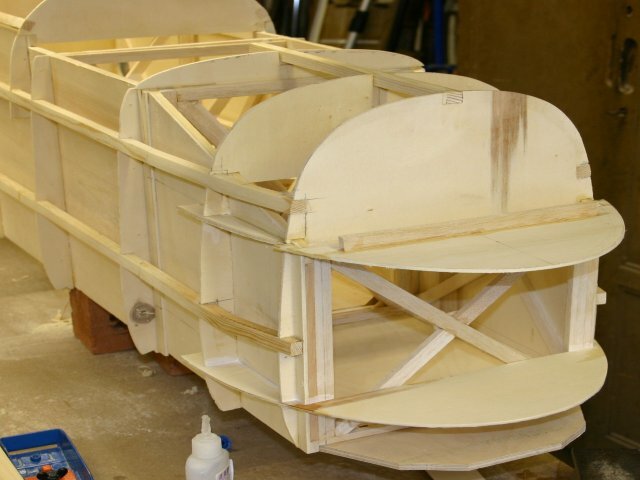 The fins are attached to the stabilisers thought a balsa block built into the fin through which the spars, LE and 9mm dowels pass (these being bonded to 3 ribs in the stabiliser). 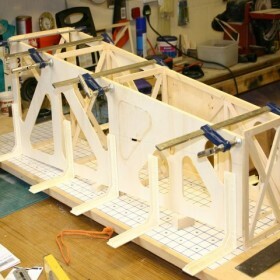 Provision has been made for mounting the elevator and rudder servos in the tail allowing short and direct control linkages. More pictures show the process…. 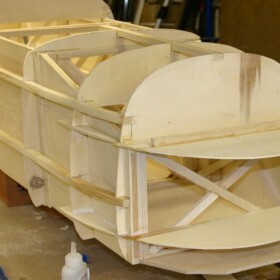 The rear end beginning with the basic shape…. 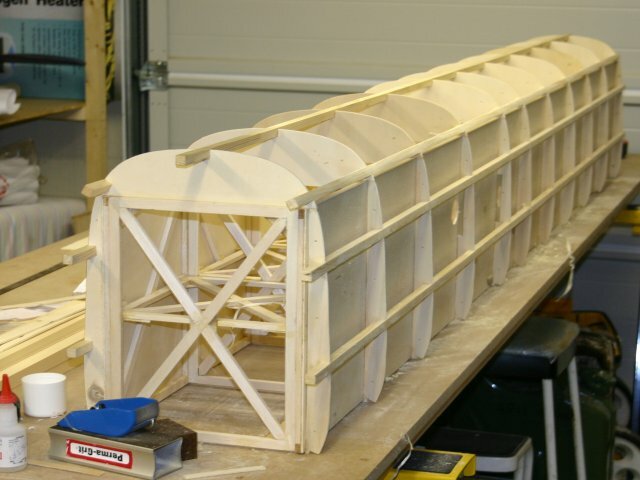 … attached to the rest of the fusepage, with tubes fitted for wings and tailplane, and ready for sheeting. ….sheeted and beginning to take on the character of the full-size. The front glazing has been produced from u-section brass, soldered together (Derek’s 50 years as a plumber came in useful here) and filled with clear plastic sheet, to form this distinctive feature of the Lincoln. The glazing has been made removable to allow access to the batteries that we intend to mount in the nose. The front glazing that kept Derek busy now in-place.